Jones had his consecutive-games played streak come to a halt at 75 after suffering a season-ending leg injury in a game against the Hamilton Tiger-Cats on June 29th. One of the best special-teams players on the club, Jones had three special-teams tackles and a fumble recovery. 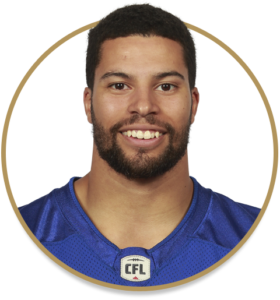 Dressed for all 18 games for the fourth consecutive season, a streak of 72 consecutive, and made his first start in the Banjo Bowl when Taylor Loffler became ill on game day… Finished the year with eight tackles on defence, 11 tackles on special teams… Jones stuffed a Ty Long punt in July, giving him five career blocked punts. Dressed for all 18 games and recorded six tackles and six special-teams tackles in 2014… Set a career-high with 15 special-teams tackles in 2015… In 2016 recorded his third and fourth career blocked punts just 23 days apart, on August 3 and August 23. Jones recorded 34 defensive tackles (23 solo) and two interceptions in seven games with Simon Fraser in 2013… In the previous two seasons, Jones racked up 78 tackles, two interceptions and 28 passes defended… His father, Ed Jones, was a defensive back with the Edmonton Eskimos who won five Grey Cups during their dynasty between 1978-82.